With so many guides and great practical examples, it’s strange how bloggers continue making common mistakes that are wasting the time of their audience. If you go through different blogs from a niche you’re interested in, you’ll find some awesome posts, but you’ll have to admit that the below-average ones prevail. No, this is not an academic essay and you don’t have to group the arguments in five paragraphs, but you do need to think about the anatomy of your blog post. The reason for that is simple: if a visitor sees chaotic text with unbalanced paragraphs with no headlines, he will bounce off before reading the title. Before publishing the post, make sure it’s attractive for the eye. 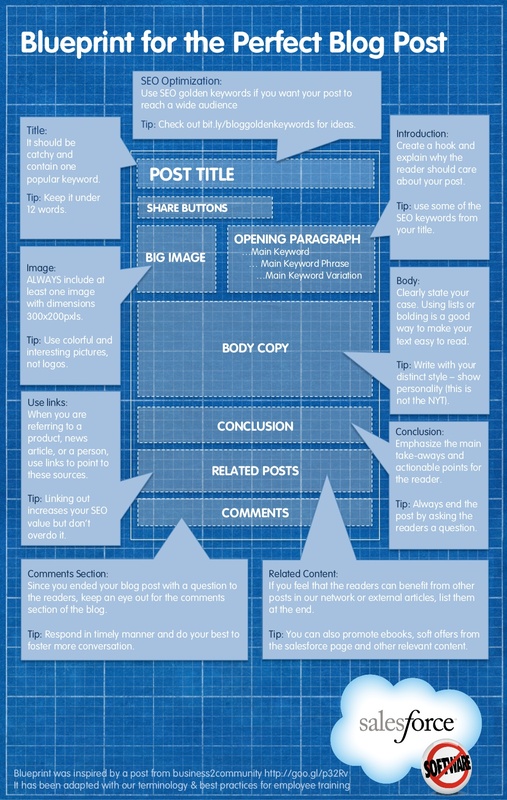 SalesForce offers a great scheme on how the perfect blog post should look like. Although you can expand your point of view (this is your own site after all), you should always remember the reasons why your audience comes to you. Create different categories on your blog and make sure they make sense regarding the overall strategy. Before publishing your new post, list it under the appropriate category, so your visitors will probably be interested in the other articles in that section. 3. Are you on schedule? You probably didn’t expect you would have to tame your free spirit when you started blogging, did you? Nevertheless, it is important to create an editorial calendar and stick to the plan if you want to keep your readers happy and grow your blog traffic. CoSchedule is a great content marketing editorial calendar that will help you plan the posts and stay on track with the publishing. Here's an infographic from CoSchedule team illustrating how to publish more consistent content that will help you grow a successful blog. This one is not for your readers; it’s for Google. 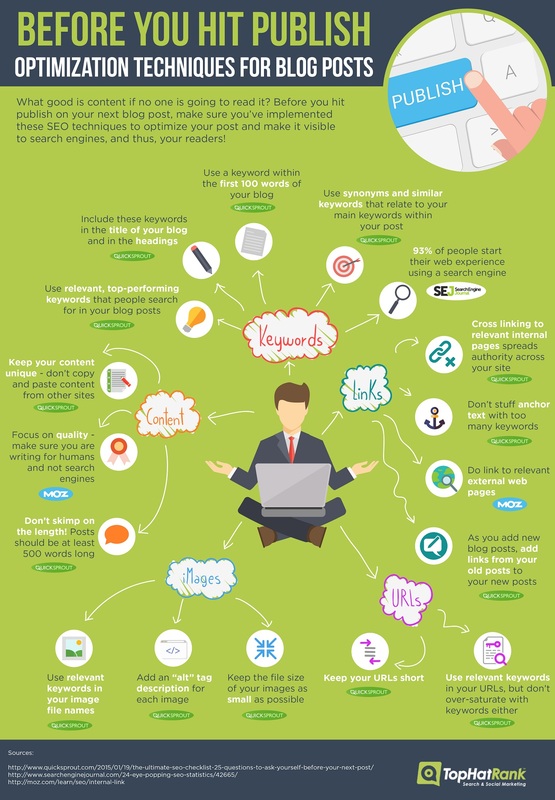 Each of your posts needs a description of up to 160 characters, which will convey the essence of its content. Sure, your posts can get published without meta descriptions, but that will leave the search engine with the first 160 characters on the page. In reality, this type of description seems meaningless in the search results. Google SERP Snippet Optimization Tool will help you create titles and descriptions with perfect length. 6. Include a call to action! Ask yourself a question: did you invite your target audience to take part in a discussion? Do your arguments provoke people’s opinions? If that’s not the case, you will need to make some changes in order to make the content more inviting. 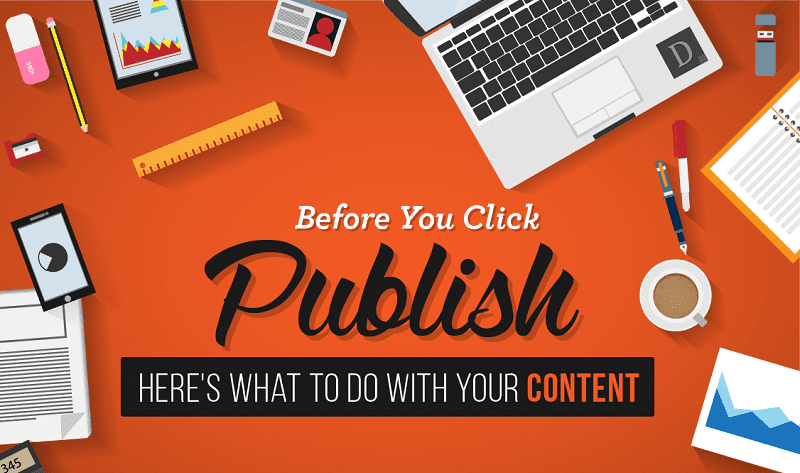 You are not writing a diary; you are about to publish a post that needs to be reader-centered. Keep the problems and priorities of your readers in mind; that will help you create content that will be well-received and commented. The reason why Internet users read blogs is to discover other people’s opinions. Your content needs to be informative, but you should also infuse some of your own personality. If you are elaborating a serious topic and you want to base your arguments on authoritative sources, you may fall into a trap or sounding too “dry”. You have a unique personality; make sure it shines through the posts you present. 8. Did you write enough? Or is it too much? Blogging is a free form of writing that’s not necessarily tied to a specific word count. Some issues can be covered in 100 words, while others require a more elaborate discussion. This is the best strategy to keep in mind: shorten the post as much as possible without affecting its quality. This type of editing will enable you to hold the attention of your reader. Did you ask enough questions? Your readers just love answering in their own minds. This blogging style can look very silly if you don’t know what you’re doing, so make sure the questions are effortlessly incorporated into the text. Linda Craig is writing enthusiast and a professional editor at AssignmentMasters. Her passion is modern British Literature and digital education tools.